Hello my friends, and welcome to this week’s prayers for the week post. The promises throughout the Bible are more numerous than I can ever give count to, but for me, I feel like the promises of the book of Revelation, specifically the verses listed above, hold a promise for us all. Several promises, in fact. Fortunately, we have the promise of those words in Revelation to comfort us, to shelter us, to give us Hope. The unfortunate reality these days, though, is that there is far too much sorrow, far too much death, far too much crying, far too much pain, and far too much suffering. 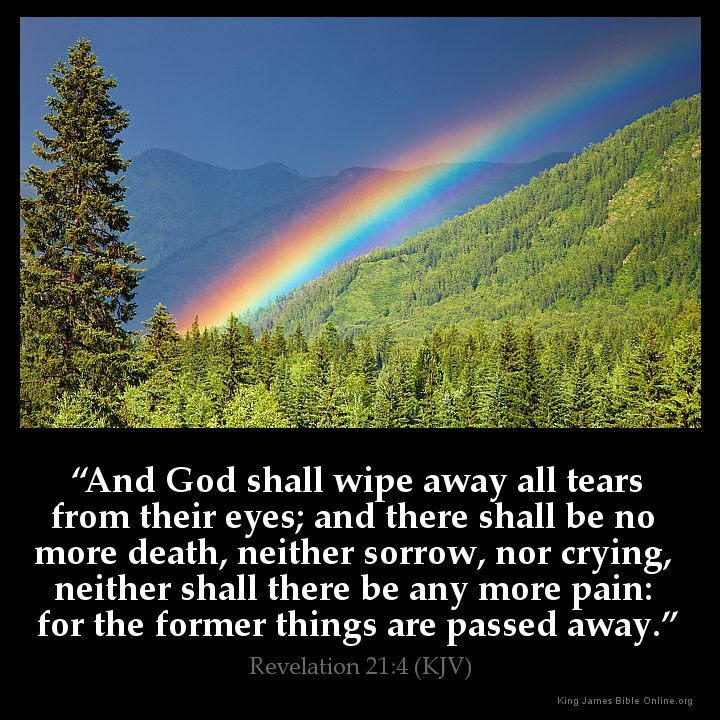 One day, Jesus will wipe away our tears, and I long for that day to happen. In the meantime, though, it is up to all of us to love one another, to give each other the strength we need to endure, to hug when needed, to comfort each other, and yes, to wipe away the tears that come. We have a lot of very heavy prayer requests, my Brothers & Sisters, and we need a lot of tears wiped away. Please join with me in comforting those that are grieving, starting with Amanda, Cate, and Daniel. From Amanda: Thank you all for your prayers for my husband and family. We have felt them and God is with us. Daniel has been moved to hospice and likely has only a few days left unless God gives us a great miracle. God must really need him with all of you praying for us. Please pray for Daniel to make a peaceful transition and for Cate and I as we learn to navigate this earth without him. Prayers for my cousin Deb and her husband Donnie: Well today’s the day we will finally make a plan for Donnie’s surgery on his belly again. .. will be walking by faith again and not by sight! The thought of another serious surgery scares me but I WILL remember fear and faith cannot coexist and prayers will be appreciated! Couldn’t have made it this far without all the prayers and I WILL PRAISE HIM IN THE STORM. We have an update on Kerry’s dog, praises all around: Great news from Kerry: Yay..! We just got the call! Buddy is doing to be ok!!! Biopsy results revealed it was an infection / inflammation from more than likely a previous injury. Whatever the case they said it had to come out! So relieved and thankful! Thanks to all for your care, support, and concern! Karen has a prayer request: Can I get some prayers for my Sis in law? She had an interview for an incredibly amazing job opportunity! She is expected to hear the news tomorrow (Friday)! Vickie has a prayer request and we add it to all of the prayer requests for the Hurricane victims and Texas: My nephew’s two little girls and my niece’s step daughter live in the Houston area and have had to leave their homes due to flooding. Pray they all stay safe. My niece and her husband are heading to Texas Saturday. Pray for safe travel and for my nephew, who has PTSD (Afghanistan), to have peace that his girls are safe. Prayers please (and praises!) for Brandi’s son Tyson: I have another praise for my son, Tyson. As you may remember he has anxiety disorder, ADD and Oppositional Defiancy Disorder. The ODD can leave us hit, head butted, kicked, spit at, pinched and more. During an episode, Tyson can punch himself in the head, punch or headbutt the car window or throw himself against walls. Life has been tough this year. My husband’s mom died. We had to home school Tyson through a cyber school while my mom or grandma kept him during the day for 6 months last school year. This summer we took him off antidepressants because of some stomach issues and God showed us that it also made his episodes more aggressive and frequent. Well here’s the praise. God’s been working on my baby for a while and Tyson is now going to the school I work at which turns out it gives him enough confidence knowing I’m there. The first week was tough. I still have bruises that are healing but my husband and I are a team and we get him to school. Each day is better and I see him smiling and laughing at school. Now a new prayer request please. Pray for Tyson to gain self esteem, find good friends, stay kind and be able to grow emotionally, socially and academically. His math is a 2nd grade level and he’s 10 in the 4th grade. We can’t put him back in third because he’s already too old and been held back before. They are evaluating him for a possible learning disorder too which would explain why he struggles in math but is on track in reading. Pray for his teachers and classmates, that they’ll accept him for who he is. Thank you my friends! Jodi has a prayer request: Please pray for my friends, the Martin family, whose home east of Houston flooded today and they had to evacuate. Nikki has a prayer request as well: Prayers for my friend’s child are greatly appreciated. Vivian is a wonderful young lady starting her freshman year in high school. Three years ago, without warning or cause, she began having neurological tics and seizures. These are extreme with multiple episodes per hour and per day. Her mother (Sharon, who could also use prayers) is a middle school teacher and she has done tons of research, visited every doctor imaginable (including those at Duke), and argued with every insurance agent trying to get treatment for her child. They had a regimen that helped greatly and Vivian started back to school on Monday (she’s been tutored at home for most of this time because she can’t properly function in school and she’s of course extremely embarrassed by these episodes). Anyway, after two days of school, the episodes are worsening. Sharon is at the end of her rope and really can’t imagine this as the life of her child. Her eldest is a sophomore in college and her youngest is a 4th grader, so she’s got a full plate. Please pray for God to heal Vivian, to find a treatment that will give her good long term results, that she’ll be filled with courage to get through this terrible ordeal, and that she’ll see His hand in all of this and know that He has a plan for her – according to His will. Please pray for Sharon to cling to her faith, to find the resources (medical and monetary) to help her child, and to know that she is doing right by her other kids and husband as she feels so discouraged right now. Please pray for Pam — her Mom is home with hospice, her husband has had some issues with his PICC line, and they have had some car wrecks that weren’t their fault. Pam needs some definite prayers for Peace, Strength, Comfort, Healing, and Love for herself and all her family. Thanks everyone!